TRITON is an air-operated diaphragm spray package that applies a high quality, decorative finish to wood and metal parts. TRITON is a more effective alternative to traditional pressure pots and standard diaphragm pumps. High Quality Finish Low pulsation output and smooth pump change over deliver a consistent spray pattern. Easy-to-use Quick colour changes and fast material refills save time and money. Rugged Construction Stainless steel or aluminum pump handles a wide variety of fluids. Available paint spray booth with General Metal, Wood or Waterborne AirPro Guns. High-Flow Air Regulators Supplies up to 35% extra air flow to gun for superior atomization. Durable Metal TRITON Pump Provides low maintenance and long life. Easy-to-use Circulation Valve Saves material and time during flushing, priming and colour changes. Heavy-Duty Suction Performance Sprays a wide variety of material viscosities. 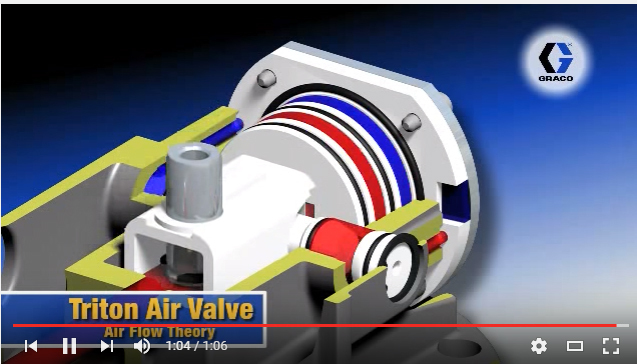 Low Pulsation TRITON Pump Delivers a consistent spray pattern and uniform film thickness. AirPro or PRO Xs Spray Gun Superior finish quality for conventional, HVLP, compliant or electrostatic applications. Triton is an air-operated diaphragm spray package that is used as a car paint equipment, spray paint equipment and spray painting equipment. Euroblast is one of the leading spraying equipment suppliers and offer long-lasting, superior quality spray painting equipments.